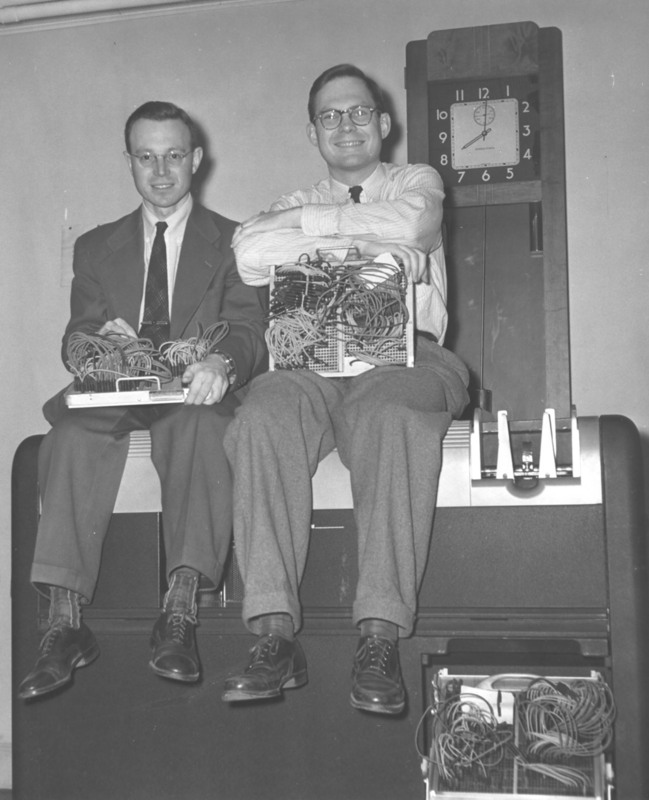 Watson Lab's Eric Hankam and Ed Reinhart of Cornell University at IBM Watson Laboratory at Columbia University, 612 West 116th Street, New York City, in 1952, having a spaghetti lunch on an IBM Type 602 Calculating Punch. Ed was using the Lab's facilities for work on his Ph.D. thesis in radio astronomy (more about this below). Photo from the collection of Eric Hankam. Click on image to magnify to full size. The first part of my radio astronomy problem was to compute the expected RF radiation from various parts of the sun's surface as a function of frequency based on a mathematical model of the solar atmosphere that had been derived by a Dutch astronomer from optical observations. The women working for me at Cornell on the very tedious computations were using Monroe calculators and making very slow progress. They were quite relieved when my thesis advisor arranged for me to carry out the calculations myself at the Watson Lab after taking Eric's course. Upon my return to Ithaca with the calculated data on the expected solar RF radiation, I turned to the second part of the problem: to compare the theoretical predictions with observation. For this purpose, I designed and built a simple variable-spacing radio interferometer with which I was able to measure the radiation from points on the sun at a particular radio frequency; in this case, 200 MHz. Happily, the measurements confirmed the theoretical predictions quite accurately. One conclusion was that, if you had eyes responsive to 200 MHz radio waves rather than light waves (and big enough to provide comparable resolution), you would see a sun which appeared considerably brighter at the edge than in the center, instead of the nearly uniform disk our eyes perceive. I have always been grateful to the Watson Lab for teaching me to use the then-current computers and allowing me to use them to facilitate my research in radio astronomy. I'm also grateful to Eric for recommending me to Willis Ware at the RAND Corporation -- it led to a 20-year stay at RAND, albeit in engineering rather than computer science. Then, between RAND and retirement, came JPL and Comsat. And since retirement, full-time consultant work for Comsat, NASA, Hughes, Panamsat, and now, Directv. Not to complain, but I must say that I do rather envy Eric's travel-filled retirement. This was the master clock for the whole building. There were clocks everywhere, including a time clock which I vaguely believe the electronics technicians punched in and out on --- not any of my people, or even the secretaries and Beth Thornton, the switchboard operator. I remember coaching Marj Severy how to speed up or slow down the master clock by teeny pendulum adjustments, saying not to do it except when Ma Bell [free call in those happy times] said it was >30sec off. Don't know if she ever did it. Also see: IBM Clock Corner, IBM Attic.